For miles around everyone knew him as “Ole Hank.” He wasn’t old, and many folks wondered if his name was really Hank, but in the mid-seventies he operated a bar at the dead end of a long back road leading to the furthest reaches of the Panhandle region of northern Idaho. In summer the dirt road continued on to remote portions of Canada, but in winter the snowplow stopped maintaining the gravel track about one hundred yards north of his establishment. Hank was a slight, wiry man with jet-black hair and dark eyes so intense they could pierce the skin of a lizard at one glance. He didn’t put up with crap from anyone, and he had a way that kept unsavory characters in his sights and on the defensive without them even realizing he had their number. Hank’s cool demeanor elicited the best behavior from everyone, especially from those who needed a trusted stranger to whom to bare their souls. In a way he was all things to all men, and that’s what made him popular. Over the years he became my friend. Forty miles from the small town of Priest River, his bar would fill with an eclectic gathering of hippies, loggers, and a variety of outcasts with backgrounds no one dared to question. It didn’t matter if it were summer or winter, every Friday and Saturday the bar was hopping. Apart from the obligatory “no firearms” on the premises, Hank only imposed two other rules: no fighting in the bar and no pot smoking. As far as Hank was concerned, that’s what the parking lot was for, himself sneaking out for a toke or two when all the glasses in the bar were full. It was not unusual to observe lanky long-hairs reeking of cannabis playing pool or discussing politics with barrel-chested logger types smelling of wood chips and spearmint lip tobacco. Any potential tension was often mitigated by a mutual respect, since many hippies those days worked in the woods as well, scraping together a livelihood gathering posts or salvaging cedar for shakes. Maybe that was why Ole Hank’s business was so successful. His place provided safe haven for those bound together by the fact that they couldn’t be any further removed from society unless they were living in Alaska. In many ways Hank and I were alike. I was a recovering Catholic trying to find my way back from a stint in the seminary, a voluntary exile that was more like a prison sentence than it was a mission to convert lost souls. Hank was fresh off a career in the CIA marked by top-secret information and covert operations that he was never willing or able to discuss. We shared war stories of how stomach ulcers almost got the best of us both. In a way neither of us seemed to fit a profile of the backwoods refugee, but then who was to say that others didn’t have similar stories. It seemed that everybody living in those parts was running from something, but no one was willing to divulge exactly from what. Hank just wanted a place where he could wile away the rest of his life selling a beer now and then. Instead, according to him, he was “cursed” with a business that flourished despite being located in the most godforsaken place anyone could dream of setting up shop. All I wanted to do was to find the meaning of life at the end of a fishing rod, and Hank blessed my simple but well-intentioned goal with a free beer or two every time we would get together. Although he didn’t say it, that was his way of thanking me for the occasional brook-trout dinner I would deliver to him and his wife in the summer. He loved brook trout because that was what he caught while growing up in the hills of Virginia on an old bamboo rod his grandfather gave him. I, on the other hand, had trouble warming up to the idea that I was catching eastern brook trout in streams that should have been rife with westslope cutthroat. The fact that cutthroat had disappeared from the region for a variety of reasons was something Hank never fully realized until I brought it up to him. Since I had come to the ends of the earth to find a Dolly varden, the disappearance of westslopes was something I hadn’t considered either. I was highly disappointed when this journey for both became a monumental quest of futility not unlike a trip to Scotland in search of the Loch Ness monster. Talking around the bar about the lack of native fish revealed candid insights. It did seem that the source of the problem was threefold. Streams that weren’t destroyed by extensive logging clear-cuts were merely fished out by folks trying to put food on the table. These were tough times and it was a tough place to make ends meet. Additionally, brook trout seemed to be more aggressive than the dainty westslope, so at one point in the past when they were stocked into the waters of northern Idaho the remaining cutthroat had little chance to successfully compete with the new arrivals. Here I was looking for a fresh start by stalking native fish in what should have been pristine country, but all I could find was rampant destruction similar to that which I experienced growing up on the Great Lakes. This irony wasn’t lost on Hank either. We would talk for hours about the environment and the misguided affairs of the United States government. Although he would never get into it, there was something gnawing away deep inside that led to his early retirement from the Agency. But like any good bartender, he would allow me to spout my indignation about Vietnam, the poor economy, and the lack of fish in an area that should have been crawling with them. He lent an ear when I got lost at night on a nearby stream and barely made it back before the bar closed—wet, cold, and covered in mosquito bites. He also applauded the time I snuck into a local river closed forever to fishing just for a glimpse of the way it used to be before everything got screwed up. I was working then on a cedar-salvaging project with a fellow hippie when he promised to take me to a secret place where we could find the cutthroat of our dreams. He told me that fishing there was prohibited, but it was unlikely that we would get caught so far from civilization. Since I was working on overcoming the lingering effects of Catholic guilt, I figured this adventure would be a true test of my progress. So one August afternoon we cut out from work early and headed up a rutted road toward Canada. When we arrived at a magnificent old-growth stand of cedar, we parked the truck out of sight and began hiking toward the sound of running water. When the river came into view it was like stepping into the Garden of Eden. We walked up to the water and peered into a deep emerald pool to observe several large westslope cutthroat sitting, feeding, or just chasing one another. If there were a cutthroat Utopia, this had to be it—the unsullied experience that I had been seeking. The area showed no signs of man’s abuse, and though it was not a designated wilderness, it could have been. I noted to my friend that it was unfortunate this section of the river had to be closed just to protect it from ourselves. Without delay we found a hopper and threw it into the water, and several fish fought with each other to get at it. All we had with us was an old spinning pole with a battered reel and a bare hook attached to the line. We took turns impaling hoppers on the hook, dapping the offerings on the water, and catching the most plump, deep, beautiful cutthroat that I ever remember seeing. In an effort to tread lightly and not wear out our welcome, we didn’t stay long. The surreal experience was like getting a glimpse of heaven, and when I shared the story with Hank that evening I could see his spirit soar with the hope that not everything on the planet was totally destroyed. His disenchantment with the government often surfaced, and his distrust of the Feds was disconcerting since he spent twenty years working for them. At the time I remember Hank grousing about the pisspoor job mankind was doing preserving a legacy for their kids. Although I had no children, he did. And he would just shake his head at the greed and excuses given for such rampant abuse of the world that surrounds us. We could talk for hours about religion, philosophy, paranormal experiences, and dreams that would take us someplace where everything made sense. When I got a seasonal summer Forest Service job along the Lochsa River in the Selway-Bitterroot Wilderness area of central Idaho, he encouraged me to expand my horizons. For several winters I returned to my wooded cabin in northern Idaho, and on weekend evenings I would make the long drive to spend time at Hank’s establishment. During those years I became enamored with westslope cutthroat to the point of obsession. Likely it was the experience on the closed river, but maybe the love affair kicked in the first time a fourteen-inch gem arose from the depths of a crystal Lochsa pool effortlessly sipping the Royal Coachman I had left to wait on the water’s slow moving surface. The vivid memory of the enchanting moment has left a lasting impression that stays with me every time I close my eyes to think about it. It was during this period that the state of Idaho came to its senses and collective forces of concern realized the value of the cutthroat to the state’s image. Catch-and-release regulations were enacted on long stretches of Idaho’s rivers that still harbored populations of these natives. Like many of the state’s rivers, the Lochsa populations exhibited signs of abuse from logging and over-harvest, but by the end of the seventies the westslope had bounced back on this river as it had throughout the entire state—with the exception of Priest River region. The provinces of British Columbia and Alberta also put into place similar restrictions during the same period, and by the early nineties Montana hopped on board to protect its compromised populations as well. Although there are still many holes in the population throughout its range, the comeback of the westslope has been remarkable. During winter bar time I would regale Hank about stories of the beautiful fish I found elsewhere in the state. Although he still loved those brook trout, he understood my lament about the woeful state of fishing in the Priest River area. One day before heading back to my summer job Hank planted a seed by suggesting that I permanently move to a place where the fishing was better. All things come to an end, he said. You find what you need to find and then move on. As it turned out I met the woman who was to become my wife that season at the ranger station on the Lochsa and didn’t return to my cabin for two winters. When I finally did I found that Ole Hank had sold his bar to someone who opened a restaurant with table cloths and wine. Like he said, all things come to an end. It took another winter before my wife and I would follow Hank’s final words to me and move to Montana. Although the main thrust of my journey to that point had been to encounter a Dolly varden (a.k.a. bull trout) in native Rocky Mountain waters, my focus had definitely shifted to include cutthroat. My research revealed that there were at least thirteen identifiable strains of this species found in various regions throughout the West, and the westslope cutthroat was one of them. There was a time when my plans included catching a sample of each in respective native habitats, but those desires were deterred by so many other distractions from grayling to steelhead. Just recently, however, I met a young fellow writing a book about all the varieties of cutthroat, and I encouraged him to vigorously pursue the project in what I hoped would be a vicarious opportunity for me to fulfill a desire that began decades beforehand in northern Idaho. Although several of these strains exist in isolated areas of the Rockies from Canada to Mexico, the westslope variety has to be the most widely distributed sub-species. And thanks to the visionary management plans enacted in the late seventies, westslopes can readily be found in Idaho, British Columbia, Alberta, and Montana. The Lochsa, St. Joe, Selway, Elk, St. Mary’s, Livingstone, North Ram, Blackfoot, and Flathead are present-day examples of rivers that offer a rare glimpse into the way things once were when Lewis and Clark encountered these native beauties, the only species of trout they would find on their journey through the interior wild West. Throughout the decades after leaving Priest River my dedication to westslope cutthroat has been unwavering. There has never been a moment when I regarded this fish with less than the reverence that it deserves. Although some anglers consider cutthroat, in general, not worthy of mention in the same sentence as a rainbow or brown trout, I have always believed that those opinions are just a matter of perspective. Naively rising to any offering in under-fished water, the westslope becomes cunning quarry where sufficient fishing pressure has educated it to the ways of the modern world. And unlike a few of the other strains of cutthroat, the westslope puts up a spirited battle as well. But it wasn’t until I started to craft bamboo rods and subsequently use what I built to pursue these symbolic vestiges of fading wilderness that I came to an understanding of what it means to be fully connected to the natural world. Remembering those days when Ole Hank used to talk reverently about catching small eastern brook trout in Virginia on his granddad’s bamboo rod, I have since encountered many others who wouldn’t be caught dead without a bamboo rod on any respectable brook trout stream from Michigan to Maine. In their minds the bamboo rod and the eastern brook trout are a perfect blend of essence and beauty. For many, the rod crafted from a natural material by a heart-and-soul artisan that can wistfully be cast to one of Mother Nature’s most stunning creatures is a match unequaled in fly fishing. That is, unless one applies the same emotional concept to westslope cutthroat. 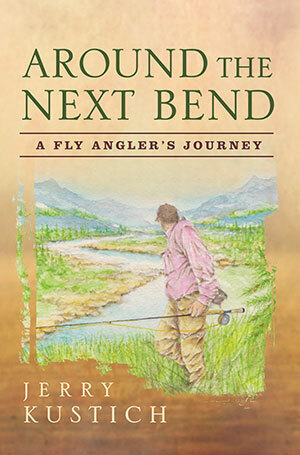 For me the quest for westslope cutthroat with a bamboo rod is less a matter of fishing than it is a spiritual experience, since there is no other way to explain the oneness I feel casting a dry fly in a beautiful setting for an exquisite native fish that can only survive if the balance of Nature is intact. Using a bamboo rod also conjures up a state of mind that transcends time. In a split second I can be having a Hemingway moment experiencing the past through his eyes or I can be entrenched in conversation with an old angler from a bygone era as if time had stopped like a train and I hopped onboard for a brief ride into yesteryear. Today’s society is so out of touch with the past that I feel blessed to be able to take that ride any chance I get. Last fall Debra and I headed to British Columbia to camp near the Elk River just over the Montana border. It was a time in our lives that we needed to remind ourselves of everything we had done over the years and how truly fortunate we have been to experience life the way we chose to live it—on our own unique terms. Since our very first date was a camping trip to Rock Creek near Missoula, we need to revisit our basic roots now and then, if for no other reason than to stimulate wonderful memories of days gone by. It was rainy and cool on the first afternoon of the trip, perfect conditions for a hatch of Olives. When I arrived at the water there was not only a hatch of Baetis, but also a number of small Western Green Drakes were emerging as well. Choosing a bigger drake pattern from a box of well-tattered flies, I attached it to the leader draped off my seven-and-a-half-foot pentagonal five-weight bamboo that I had recently completed. After fooling a couple of modest cutts, I then landed a robust fish— thick, deep, and full of life. My mind then wandered back to northern Idaho as if I had just stepped off the time train. For a brief moment I was back on that closed section of water with my friend thirty years ago. I remembered how those fish stimulated my intense interest in westslope cutthroat and wished that the opportunities to encounter such a wondrous creature wasn’t disappearing into the oblivion of the seventies. Little did I know then that I would be trying to recapture the magic of that day ever since. The fish I had just released brought it all back. It was a replica of that special westslope cutthroat I had caught years ago. If it wasn’t for those forbidden fish and the encouragement of Ole Hank I wouldn’t be in the exact spot I was now, standing on the Elk married to Debra with a bamboo rod I made in my hand. It was that simple. A chain of events was put into motion then that led to this exact place in time. I don’t know what became of Ole Hank, but I certainly have not forgotten our time together. Every now and then I toast a beer to him, westslope cutthroat, and bamboo rods. As he said, you find what you need to find, and then move on. I remembered those words that day on the Elk and hoped that he found what he was looking for along the way as well.